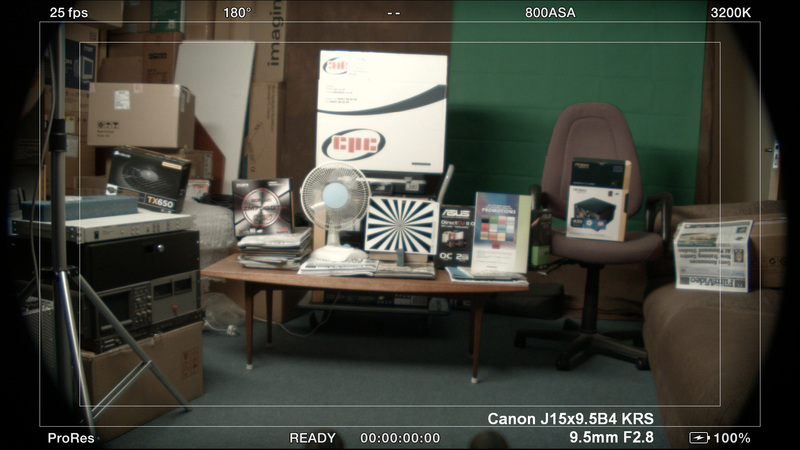 We have a Blackmagic Pocket Cinema Camera on demo, and are experimenting with various (older) lenses, including building a rig to use 2/3" B4 zoom lenses with the BMPCC. 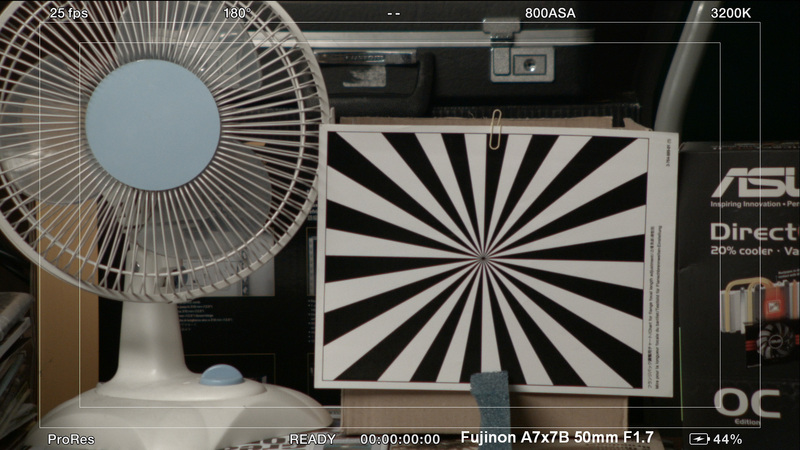 The tables below show frame-grabs from our tests to assess vignetting and focus at different focal lengths and apertures (F4, F2.8 and wide open), with and without using a doubler (where the lens has one). 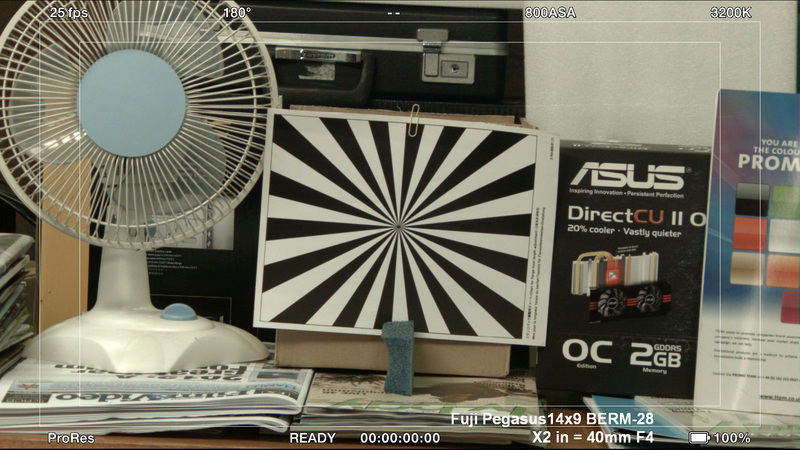 This video (above) contains a few shots of Salford taken on my way home, using a Canon J11x4.5 B4 lens on a BMPCC. 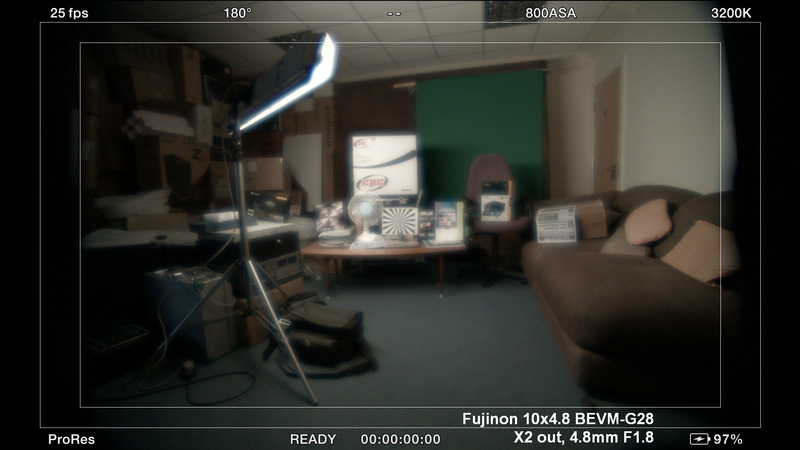 It's intended just to show the range of shot sizes that can be obtained from a single lens, from very wide to telephoto, so there was no planning and not much finesse to it, no power to the zoom servo (ie jerky zooms), etc. 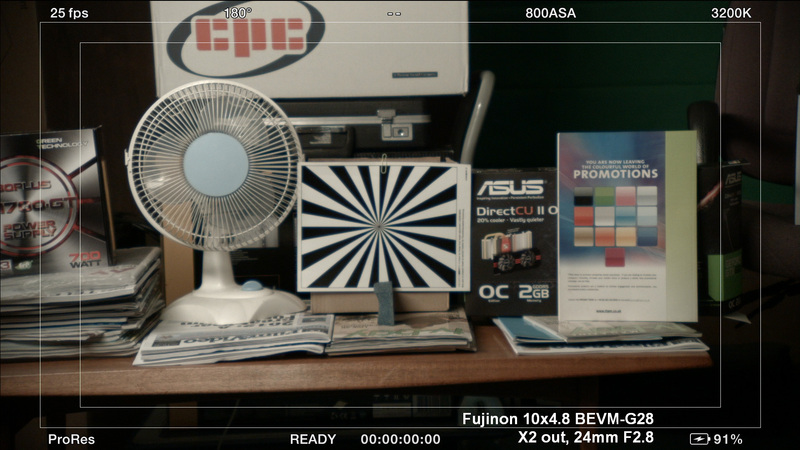 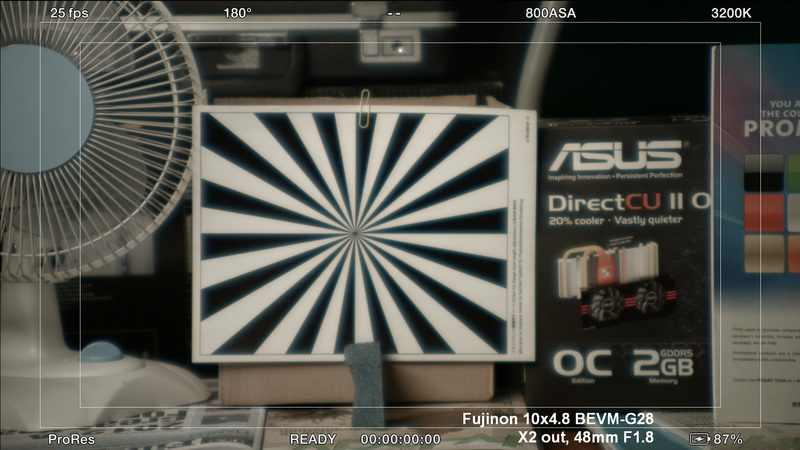 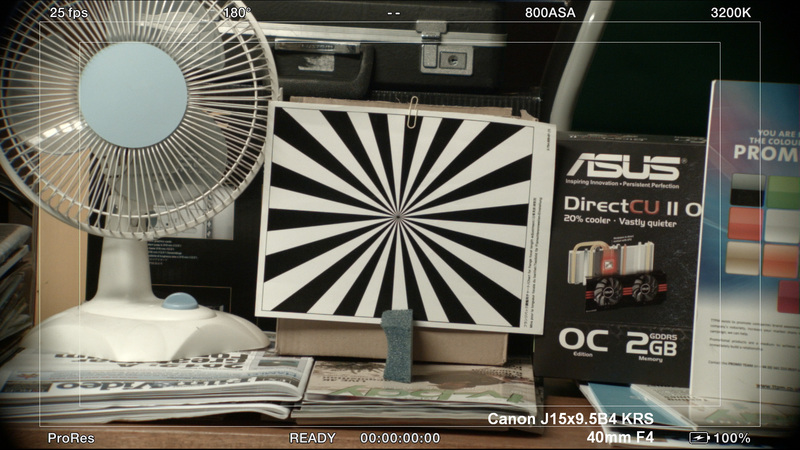 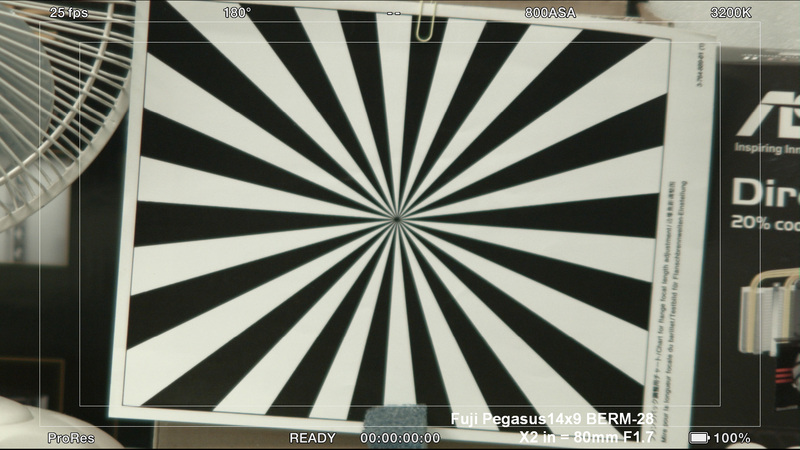 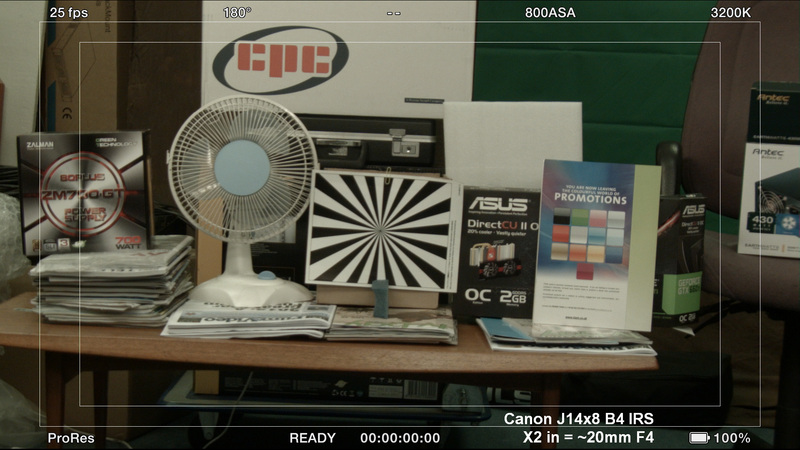 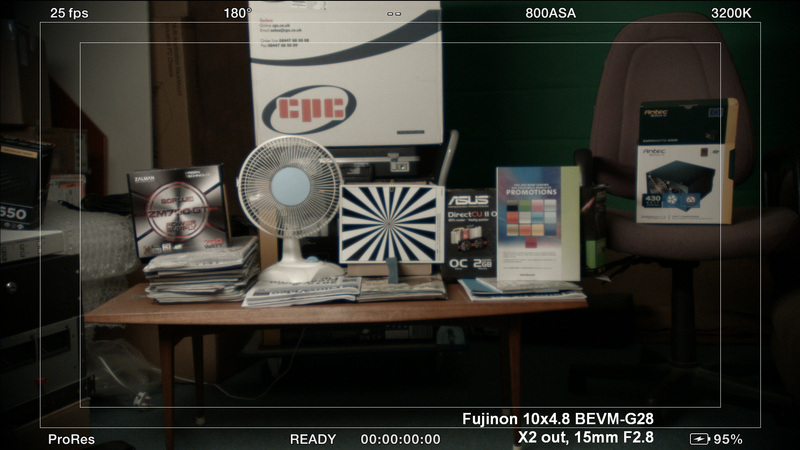 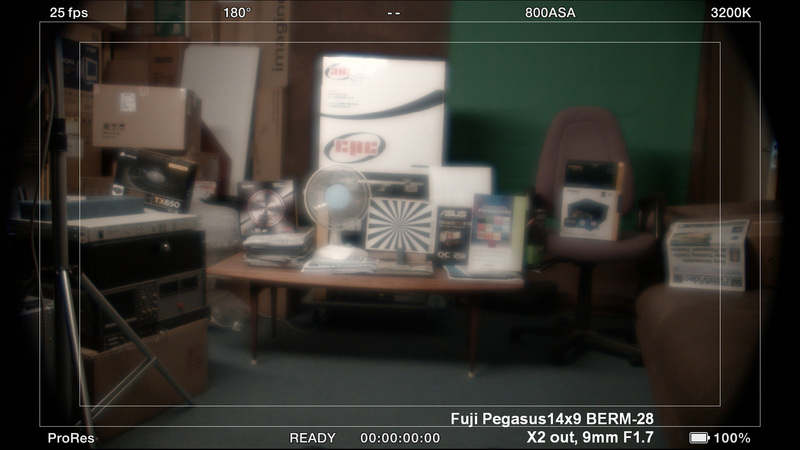 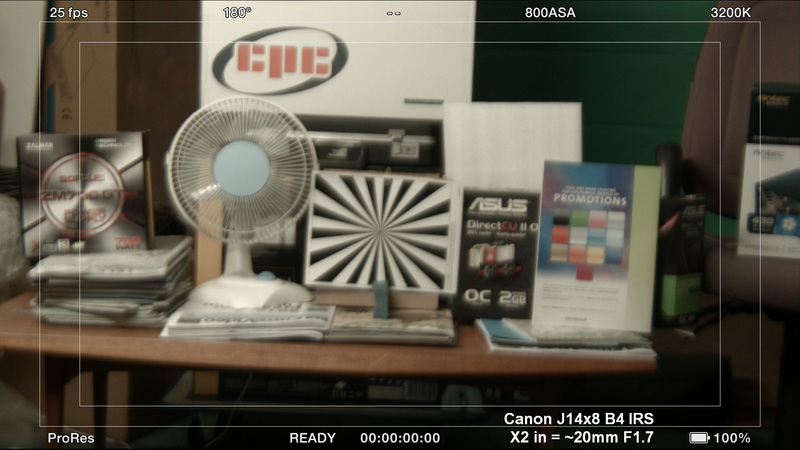 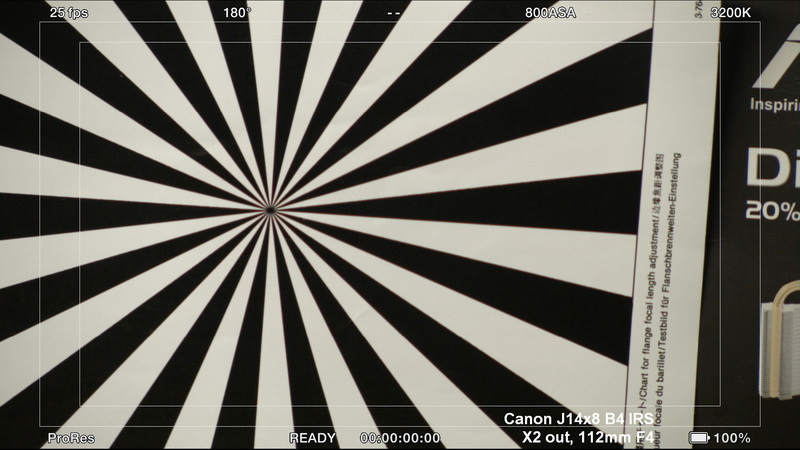 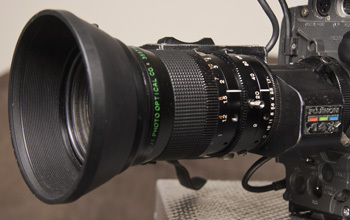 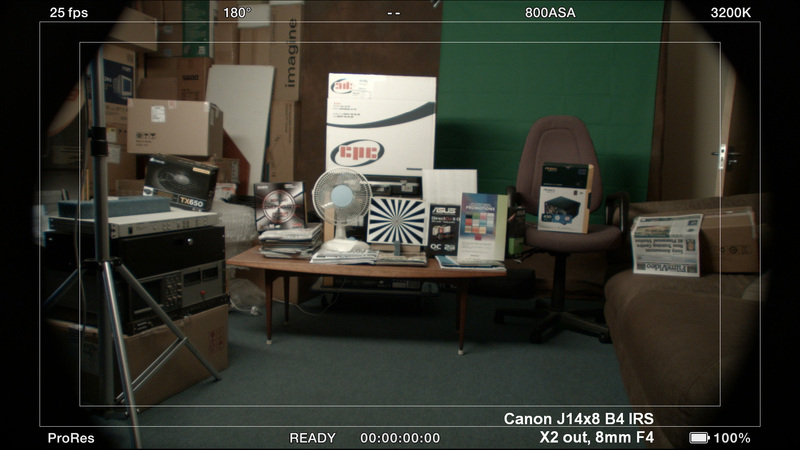 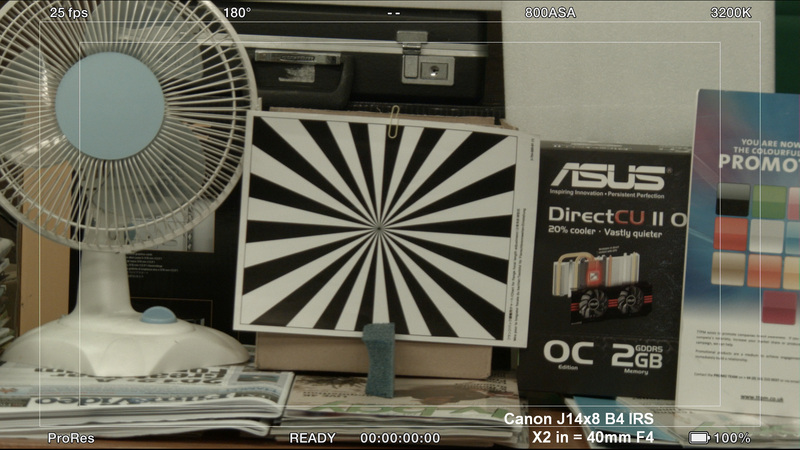 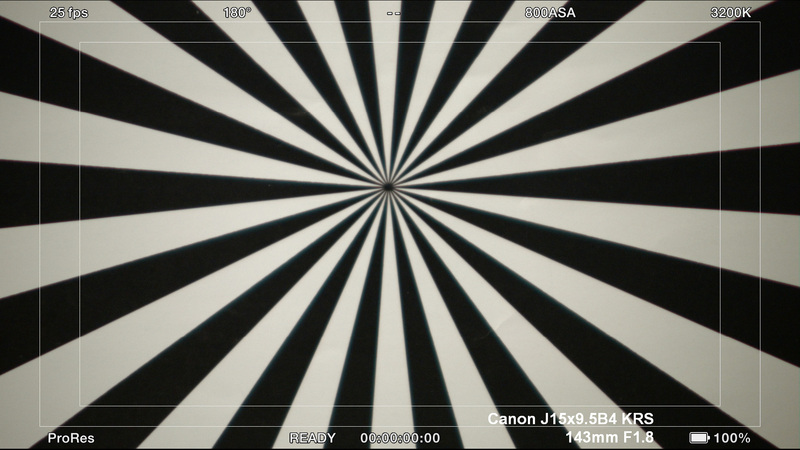 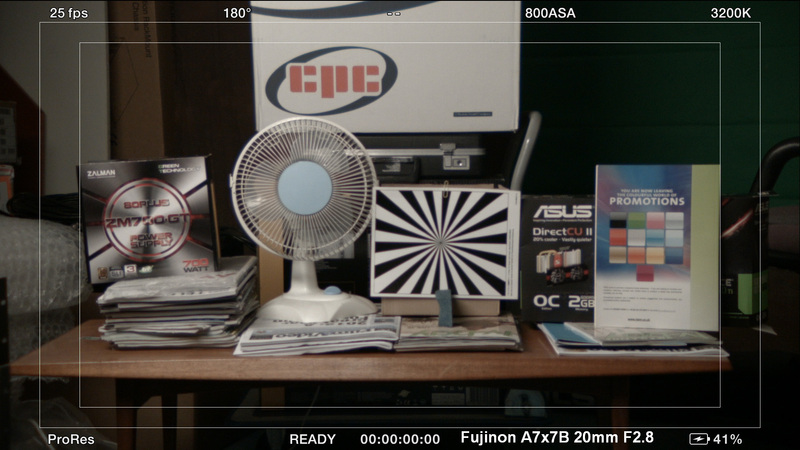 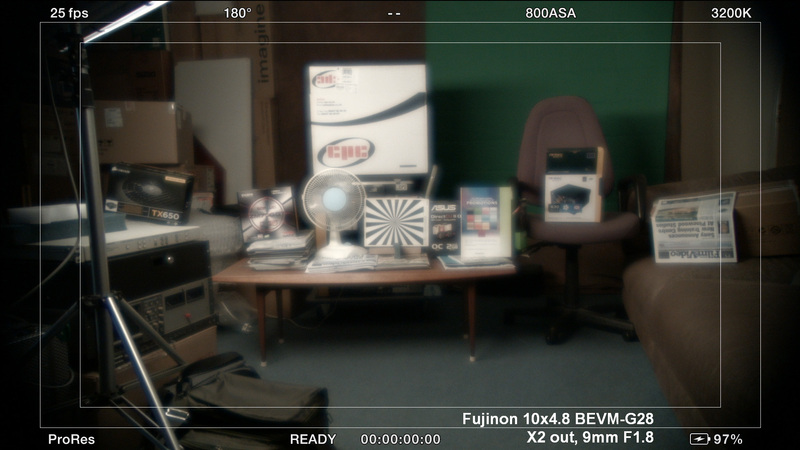 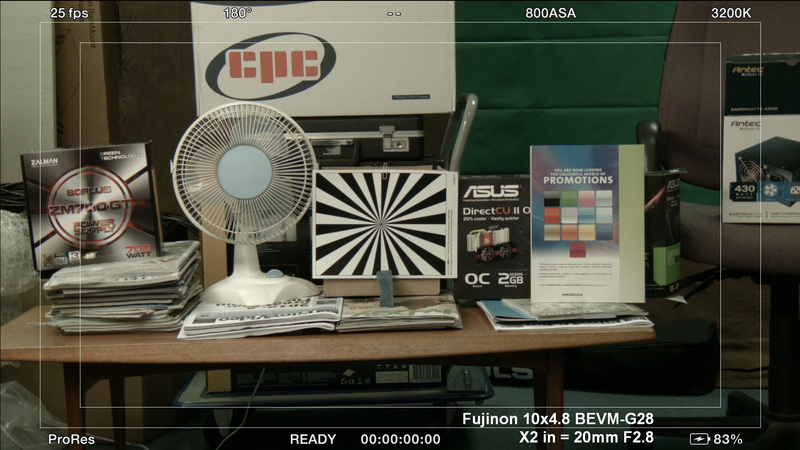 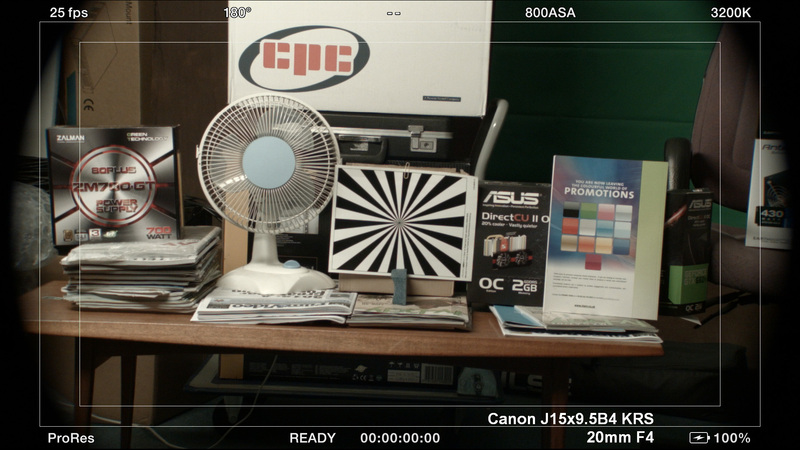 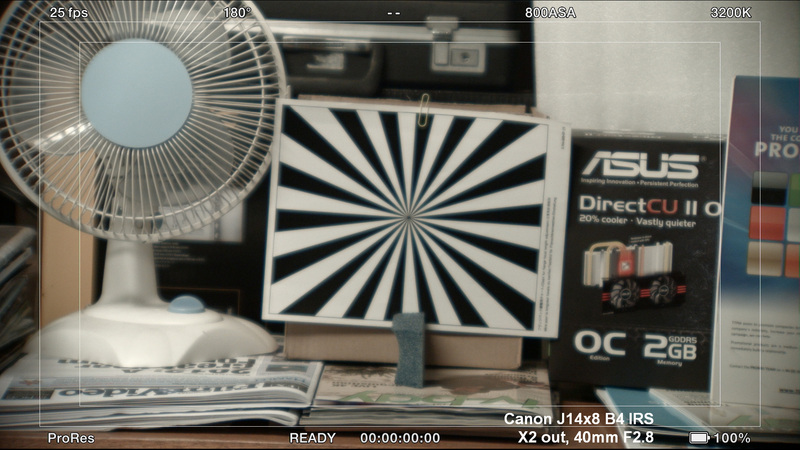 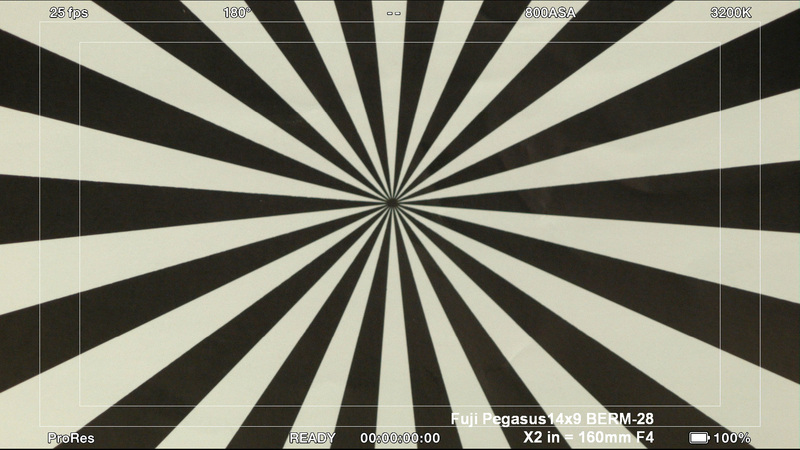 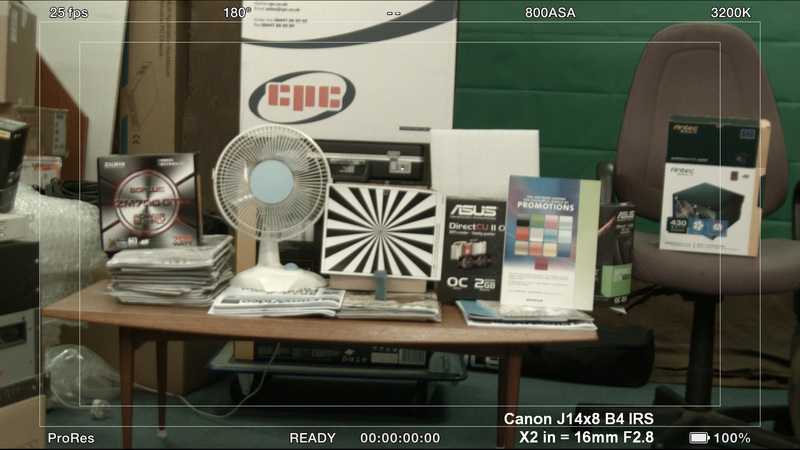 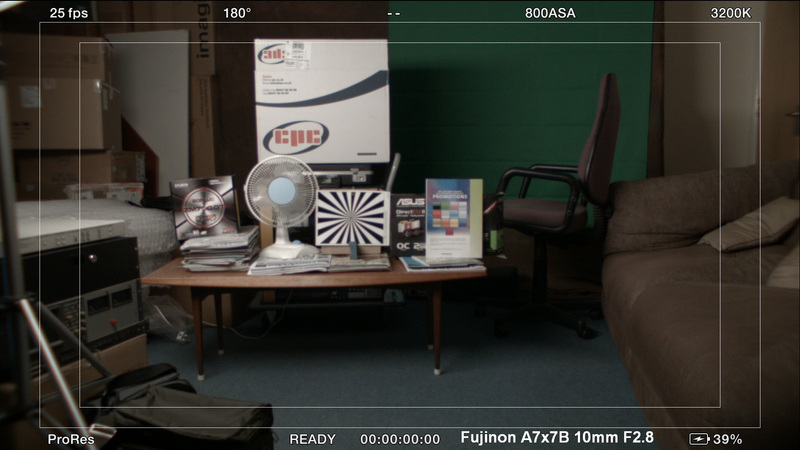 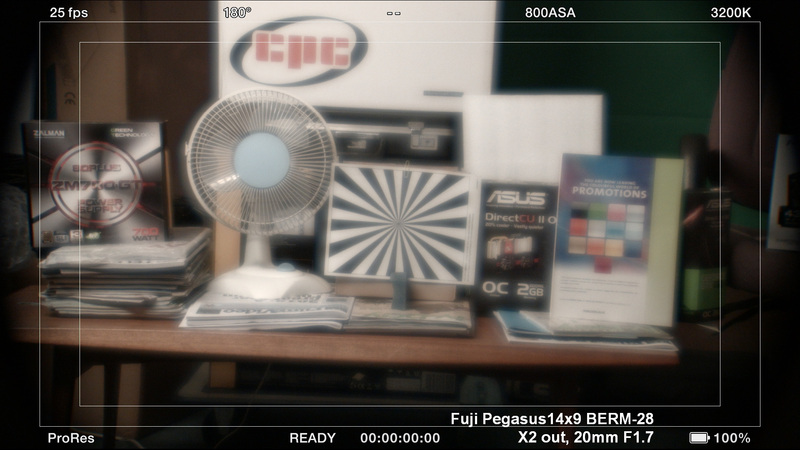 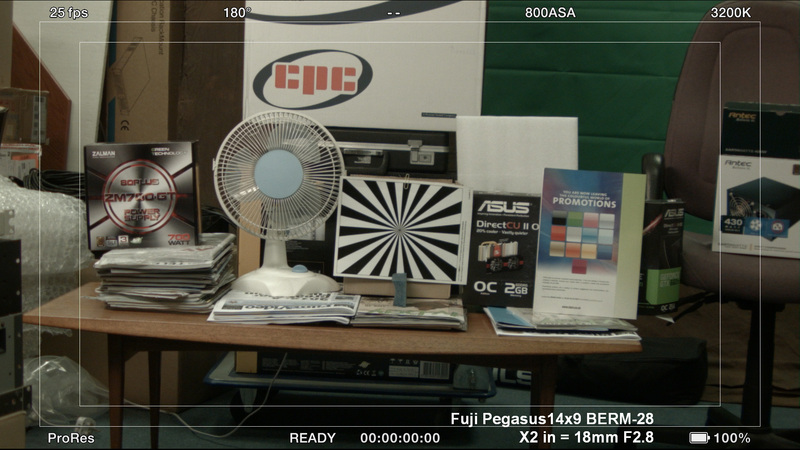 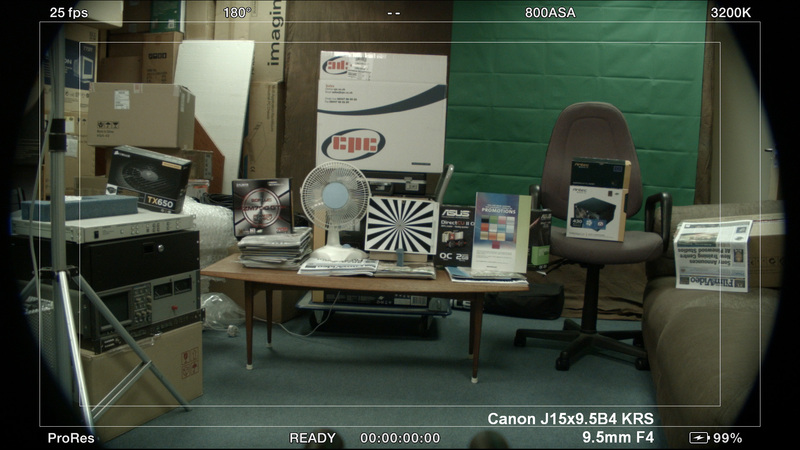 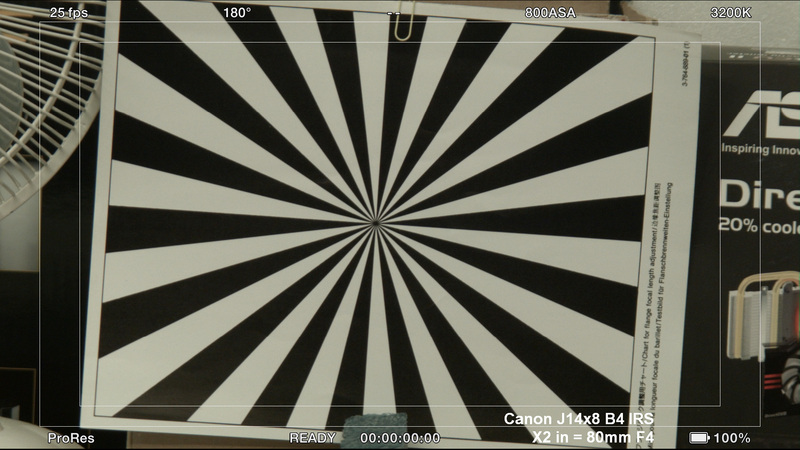 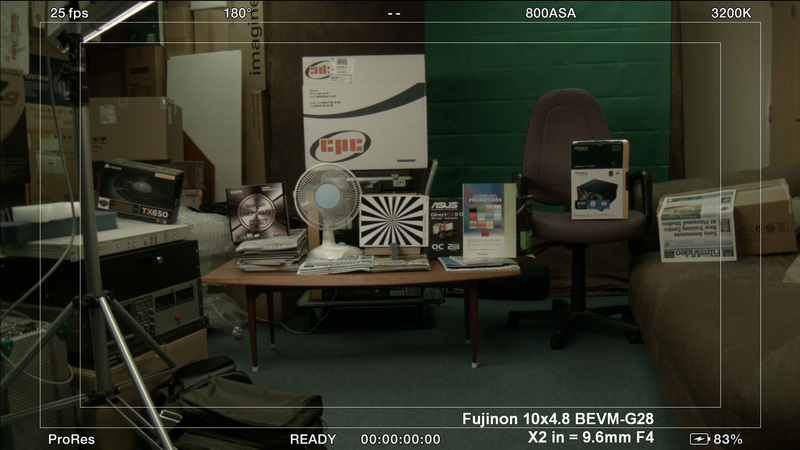 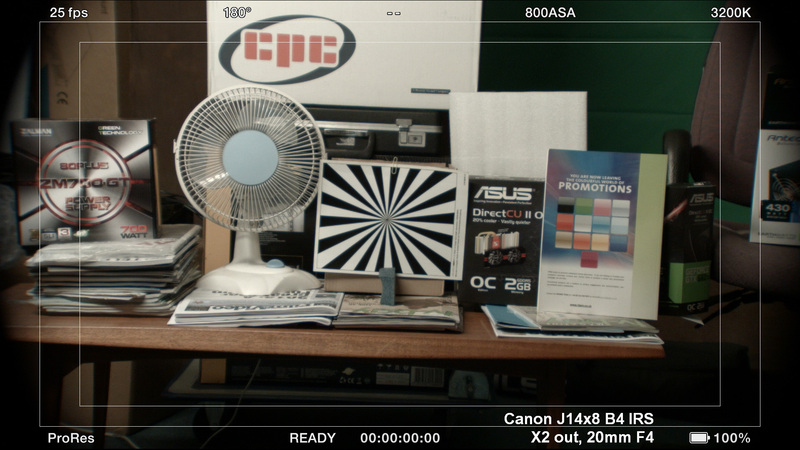 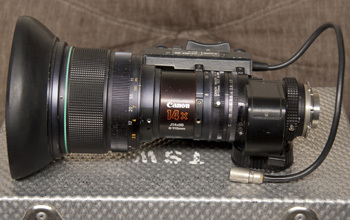 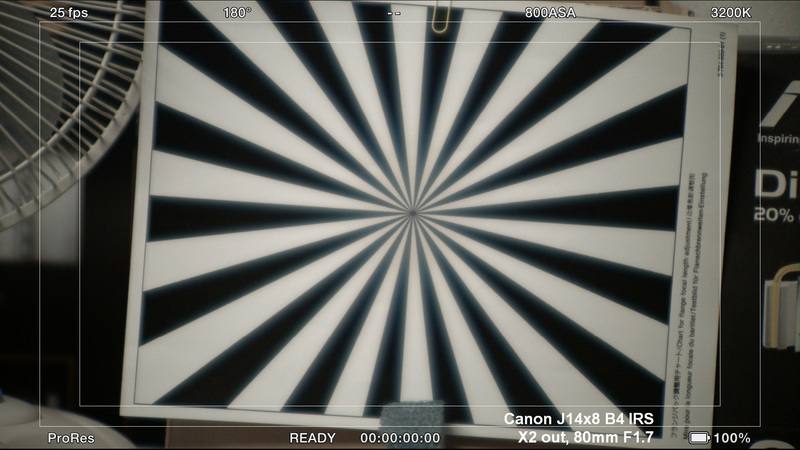 This is a used Fujinon A7x7 SD 2/3" broadcast B4 wide-angle servo-zoom lens, pictured and tested below. 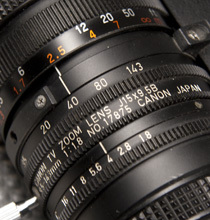 The lens has a focal length of 7-50mm and a minimum focusing distance of .3M (1ft). 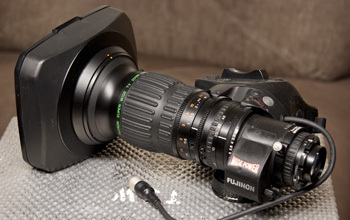 Lens hood and front cap included. 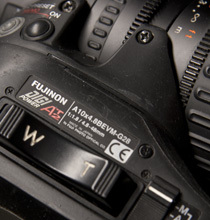 This SD B4 wide-angle lens has a focal length of 7-50mm and a maximum aperture of F1.7. It neither includes a x2 doubler, nor does not feature internal focusing, and is probably from the 1990s(?). However, it does seem to produce an above-average circle of light so scores well in terms of not vignetting. 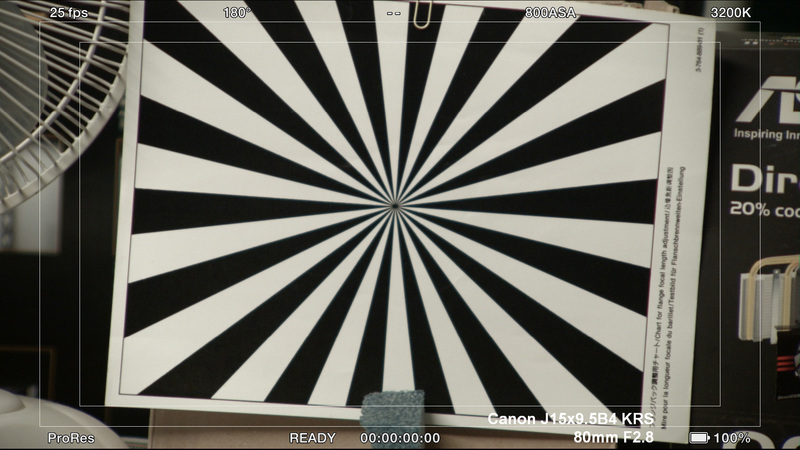 Use at all focal lengths when cropping in post. 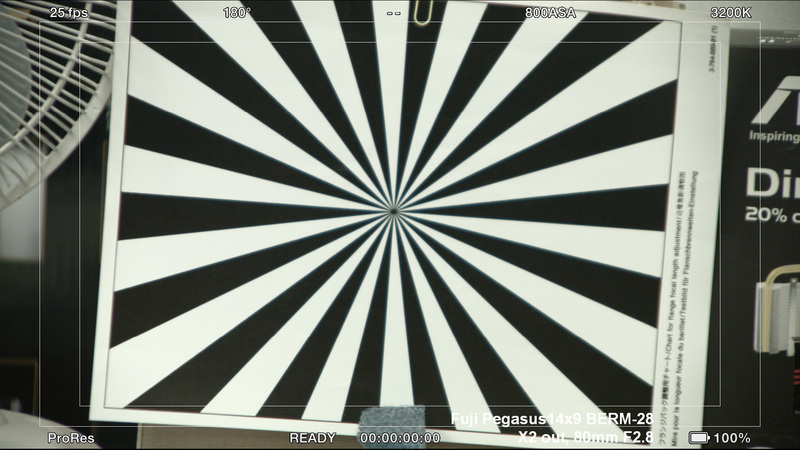 Allows a clean 1280x720 to be extracted from the native 1920x1080 on the BMPCC. This broadcast SD B4 wide-angle lens has a focal length of 4.8-48mm and a maximum aperture of F1.8. It includes a x2 doubler, and features internal focusing. 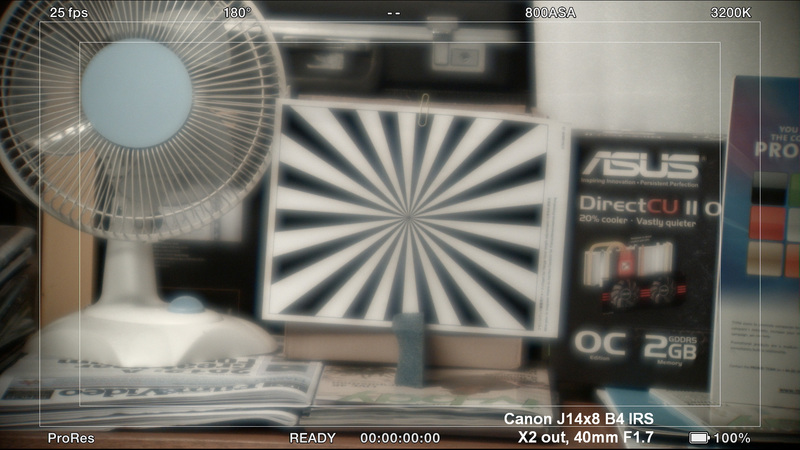 This lens also has a macro mode. 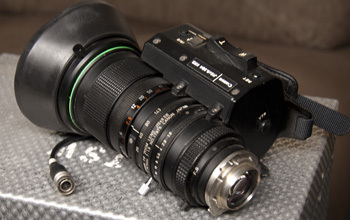 This SD B4 standard lens has a focal length of 9-126mm and a maximum aperture of F1.7. 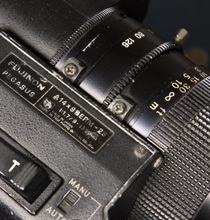 It includes a x2 doubler, but does not feature internal focusing, which gives some indication of its age (1990s). This lens also has a macro mode. 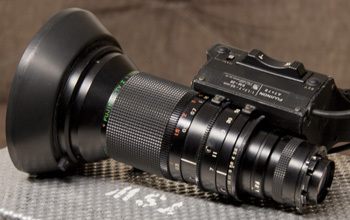 This SD B4 standard lens has a focal length of 8-112mm and a maximum aperture of F1.7. 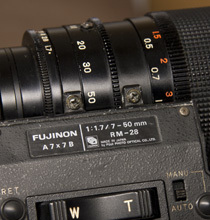 It includes a x2 doubler, but does not feature internal focusing, which gives some indication of its age (1980s/90s). This lens also has a macro mode. Getting a totally vignette-free image without the doubler - even at longer focal lengths slight edge shading still persists. This SD B4 standard lens has a focal length of 9.5-143mm and a maximum aperture of F1.8. 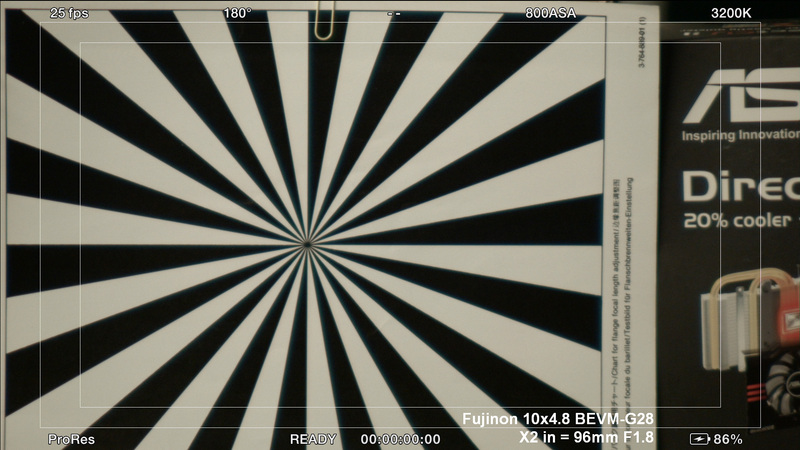 It neither includes a x2 doubler, nor does not feature internal focusing, and is probably from the 1990s(?). 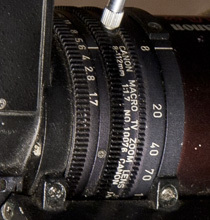 Some versions of this lens also have a macro mode, although this particular lens doesn't. Inspired by the techniques shown at the IOV Videoskills Roadshows, in this short video Martin talks about, and demonstrates, the benefits of using lighting when filming in modern office buildings. 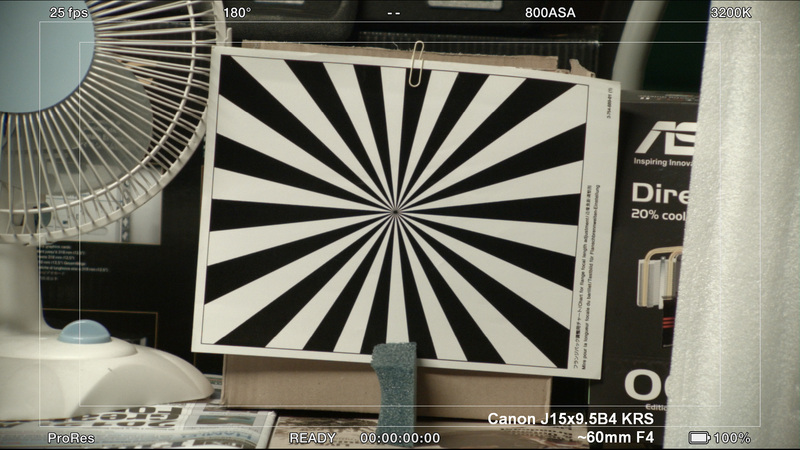 With modern cameras able to get a well exposed picture in fairly low light, it's easy to forget what a difference lighting can make.